SAN AGUSTIN, Surigao del Sur, Jan. 31 (PIA) - Two communist terrorists died in an encounter with the government troops in San Agustin town, Surigao del Sur last January 24, 2019. The operating troops under 401st Brigade were conducting security operations in the hinterlands of Sitio Kabulohan, Barangay Buhisan in San Agustin town when more or less 10 NPA terrorists fired at them prompting them to return fire. The firefight lasted for about five minutes, after which the armed group scampered in different directions. The troops also seized an M14 rifle, anti-personnel mines and ammunition, subversive documents and other war materials. According to Brigadier General Andres Centino, the security operations against the CPP-NPA Terrorists (CNTs) in the boundary of Agusan del Sur and Surigao del Sur started since December 2018 after they abducted the Cafgu Active Auxiliaries (CAA) and two soldiers in Barangay New Tubigon in Sibagat, Agusan del Sur. The NPAs took the CAAs and soldiers and used them as human shields until now. The security operations accordingly, intend to go after the armed groups responsible for the abduction. Centino said the two cadavers are still in the area as of this time. “The operating troops were not able to immediately extricate them due to bad weather,” he said. BUTUAN CITY, Jan. 31 - The Department of Agriculture-Philippine Rural Development Project (DA-PRDP) in Caraga Region in partnership with local government units recently breaks ground with two infrastructure projects totaling Php158 million. 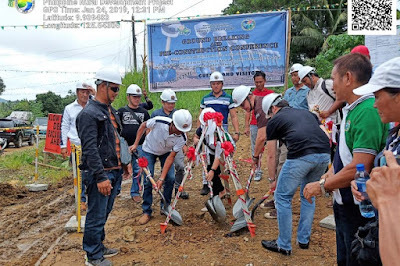 These are the construction of the Php50 Million Communal Irrigation System (CIS) in Barangay Poblacion, Rosario, Agusan del Sur and the construction of the 3.62-kilometer Farm-to-Market Road (FMR) in Barangay R.E. Ecleo, San Jose, Province of Dinagat Islands amounting to Php108 million. The construction of 4.76-km Main Canal with structures of the Limbatangan CIS in Rosario has a length of 4,961 meters with 23 units of canal structures to serve 264 hectares of rice area in Barangays Libuac, Poblacion and Tagbayan. The said project is seen to increase rice production from 3 metric tons to 4 metric tons per hectare for conventional rice farming and 3 metric tons to 3.6 metric tons per hectare for natural farming. In addition, a total of 1,623 households or 8,226 individuals would benefit from the project after its completion. “We thank the government for giving us this project. I believe that this intervention would enable us to expand our production area,” said Jimmy Magbanua, Vice Chairperson of Limbatangan Farmers Irrigators’ Association. On the other hand, the construction of R. Ecleo–Upper Laguna FMR will benefit 1,571 farming and fishing households in San Jose, Dinagat Island and would allow better access to and from the agricultural production areas, public market and processing centers, and government social service centers. The FMR traverses the barangays of Ma-atas and Sta. Rita and connects to Brgy. Laguna where it ends at Sitio Upper Laguna. It will link to the national road where the proposed cassava buying station and processing center would be located. 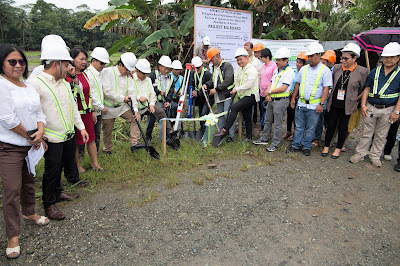 Both groundbreaking activities were followed by a pre-construction conference participated by the stakeholders of the project such as farmers, barangay officials, and the Barangay Implementing Team (BIT), municipal implementing units, PRDP regional counterparts and the contractor themselves. Purpose of which is to discuss the different aspects of the project and the role of each stakeholder that would ensure the smooth and proper implementation of the project. “We’re briefing the stakeholders to empower and capacitate them in the community to become active and viable partners in the operation and maintenance of the project,” said Infrastructure Component Head Engr. Rene Morales.